Someone’s been trying to recreate the accident that gave Matt Murdock his abilities, while also releasing all of the failed experiments out into the unsuspecting public. Faced not only with the maniacal wiles of a madman, but also with losing his friend Foggy to cancer, Daredevil may be stretched a little thin. How will he cope? More after the jump! Previously in Daredevil: Someone was trying to recreate the accident that gave Matt Murdock his powers and let all the failed experiments loose on the city. When one of these experiments ends up on his doorstep, Matt has no choice but to leave his friend Foggy’s bedside to go out in search of the madmen trying to create their own version of Daredevil. 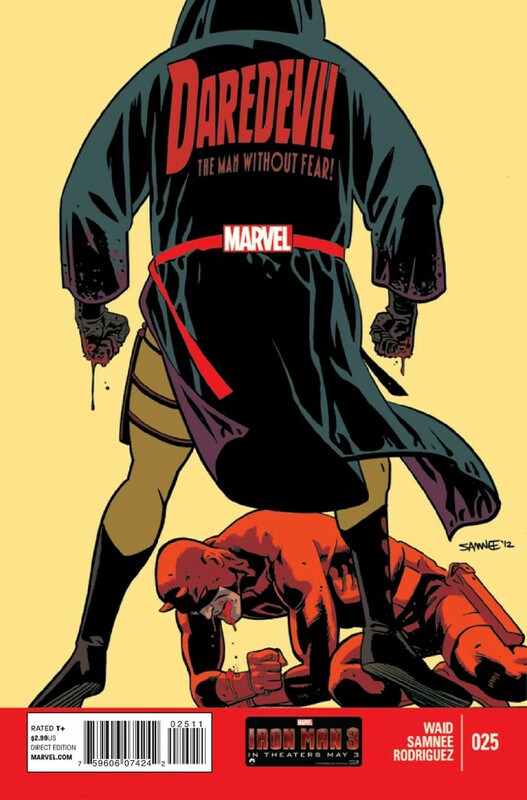 Following the only lead he has, Matt Murdock suits up and follows a young man who claims to have escaped the experiments performed on convicts in order to successfully recreate the accident that turned Murdock into Daredevil. Although, upon arrival, it all turns out to be a trap as the young man’s heart bursts and Daredevil ends up having a showdown with a man who calls himself Ikari. In a fight to the death, Ikari proves to not only be Murdock’s match, but that and much more. One of the great things about Mark Waid’s writing is that his plots are rarely skin deep. The idea of potential Daredevil-rejects running around the city may seem like par for the course when it comes to comic plots, but Waid manages to throw in a curve ball with the introduction of Ikari. Ikari’s training mimics Daredevil’s and his abilities prove to be both Murdock’s and then some. What his existence means for Murdock and what it could promise for the future raise all sorts of questions that this book only begins to scratch the surface of. Knowing Waid, there’s more than meets the eye with the plot and it’ll be interesting to see where he takes this. Plus, Ikari’s outfit is a bit evocative of the original Daredevil color scheme with a dash of Japanese ninja thrown in for good measure. And who doesn’t love the original yellow-and-red-vaguely-McDonald’s-invoking Daredevil costume? The wonderful thing about the visuals in this particular run of Daredevil is how simplistic the art is. There’s a very retro-feel to Samnee’s art, but he’s not one of these artists that tries to bash the reader over the head with throwbacks to the past. Instead, Samnee manages to create something all new and it really works with this book. When partnered with Javier Rodriguez, each panel is simple and tastefully done, never bombarding the reader with unnecessary sensory overload. This book in particular, though, shows how well Samnee and Waid work together. Much of this book is a giant chase scene. It has a great reveal at the end, true, but most of it focuses on a back and forth fight between Ikari and Daredevil. While many books set up this way can seem forced or overly familiar, this book doesn’t. It feels very alive. Waid and Samnee both have come together to create a book that plays to all the senses the best they can. Whether that means focusing in on DD’s sonar vision or through the furious swipes made by Ikari’s kusurigama blades, the book is very vivid with motion. It’s hard to achieve that synergy between writer and artist, but Waid and Samnee have done that tenfold. I may be a bit biased when it comes to reviewing anything by Mark Waid just because I personally think he’s one of the great comic writers out there. Putting that aside, though, this book is really relevant for the Daredevil storyline and will probably confuse the reader if one were to skip this issue. Plus, why would you want to? This book alone is packed full of action that plays on the senses just right. And, quite frankly, it’s beautiful to look at. Skipping it would be a mistake. Not to mention, if you missed the previous issue, there’s still time to follow along if you pick this one up soon. Overall, Daredevil #25 earns a four out of five stars. Danielle Luaulu lives in San Francisco where she constantly toes the line between nerd and lady. As a teenager, she fell in love with Sandman’s Morpheus and started wearing lots of black. Now, she's a graduate of SFSU where she studied creative writing and lives vicariously through her level 10 drow bard. She has a love and fascination for all things super and natural, as well as supernatural. Comics are her life, as well as playing games in which she gets to be the hero or villain or a combination of both. Depends on her mood.